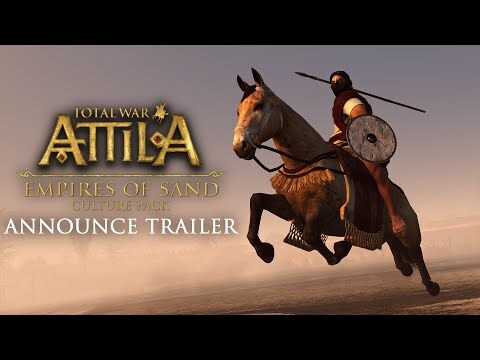 Buy Total War Attila: Empires of Sand and get the games download now! NOTICE: Activation key must be used on a valid Steam account, requires internet connection. Requires the base game Total War™: ATTILA in order to play. New Factions; Aksum, Himyar and Tanukhids with new unique units. New building trees: While migrating, the Tanukhids have access to a completely new Horde building tree comprising 34 new buildings, each with unique artwork and campaign effects. Unique event chain: A brand new event-chain guides you in your rebellion against the Romans, and leads you ultimately to settlement and the formation of an empire. Dynamic Barrack unlocks: Completing missions unlocks higher tiers of barracks and provides access to new, defecting Roman units. The Kingdom of Aksum grows prosperous through trade; the Silk Road is kind to those who know how to harness its riches, and the Aksumites have spent their lives trading along it. Unique Event Chain: A unique event chain challenges you to claim a series of resources in exchange for unlocking new spice buildings, and Gupta Indian influenced units. Marib Dam - Unique Events: The Marib Dam was an engineering marvel of the ancient world, though it was famously breached. Playing as Himyar, players will periodically be presented with options to make repairs. Leaving the dam untended brings the risk of floods, and repair is costly – however, in good working order, the dam can bring a powerful series of benefits.